Join Scentsy for half price in February! Scentsy introduced a second Starter Kit option for launching your Scentsy business! During February 2019 only, you have two Scentsy Starter Kit options to choose from when you launch your Scentsy business and become a Scentsy Consultant! Full Scentsy Starter Kit $99 USD. Actually, in February, you get the Double Starter Kit for joining! This Starter Kit gives you everything you need to start your new Scentsy business this month, and sets you up for the new catalog debuting in March with catalogs and scent testers. Discounted (half-price) Escentials Scentsy Starter Kit $49 USD. 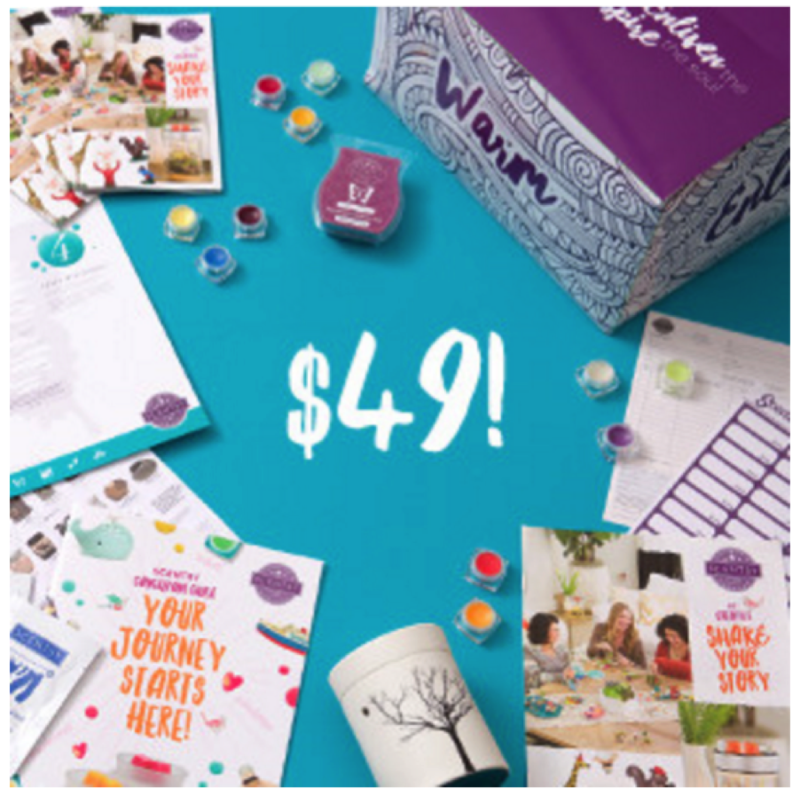 This kit gets you started on your Scentsy business quickly and with less investment while still getting some of the core tools necessary to kickstart your Scentsy business and become a Scentsy Consultant. If you’re ready to start your own business and Join Scentsy, simply follow this link on my Scentsy website to Become a Scentsy Consultant. The $49 Scentsy Starter Kit is only available between February 1-28, 2019, or while supplies last. Please note that the contents of your Starter Kit may vary and the price doesn’t include local tax and shipping. The other Scentsy Starter Kit option available during February is the awesome $99 Bonus Starter Kit that is loaded with great business supplies and Scentsy products to help you launch your new business. Contents of your Starter Kit may vary slightly depending on the availability of the products in the kit and the $99 price doesn’t include tax and shipping. So, during February 2019, you get to pick whichever of these kits you feel is the best fit for you when you launch your Scentsy business! Both options of Scentsy Starter Kits also receive 3 free months of your own Scentsy Website! To launch your Scentsy business and become a Scentsy Consultant today simply follow the link below! Ever wonder if you think you’d be an awesome Scentsy Consultant? Check out this blog post where I talk about some of the things that help make for an awesome Scentsy Consultant and answer the question – Could I be an awesome Scentsy Consultant? Once you’ve joined Scentsy or to learn more about how to get your Scentsy business off to an amazing start and earn some of the amazing incentives only available to new Scentsy Consultants, follow this link to get Tips for Starting Your Scentsy Business. *February 2019 is the only month to join for the half-price Escentials Kit, or the full price Double Starter Kit special so don’t miss out! If you have thought about joining Scentsy, but didn’t want to commit to the regular price of $99 Scentsy Starter Kit, you’re in luck! During the month of February 2019 ONLY, you can sign up to sell Scentsy and get the smaller “Essentials” Scentsy Starter Kit for only $49!! Of course, the full Scentsy Starter Kit for $99 (USD)/$119 (CAD) is also available during March. This Starter Kit contains everything in the Escential Starter Kit, plus additional demonstration products. You get the option to choose which Starter Kit you prefer during the enrollment process. So, sign up and join Scentsy today!